Deanna Shrodes: Do you use this lame excuse? A rightly focused life consists of fulfilling the expectations that we have formed ourselves based upon what God has spoken to us. I often hear people speak of doing only what they can actually do and not worrying about what others expect them to do. I agree. But what happens once you've already agreed to something? Does character and integrity not demand that you fulfill it? 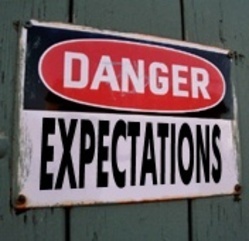 We are not responsible for others expectations that we have never invited, initiated nor agreed to. We are, however, responsible to fulfill an expectation when we initiate or consent to it. For instance, part of getting married is making a covenant to fidelity. What would it be like if your spouse later said, "I didn't meet your expectations in being faithful to you but I can only do what I can do..."
Let's say you apply for a job and before accepting the position they say, "this job is 40 hours a week." So you come in the first week and work for 35 hours. The following week you work 15, and the next week you work 30. If they haven't fired you already, you speak up and say, "I know I haven't been working 40 hours. I've come for whatever time I can, but you'll just have to understand that I can't fulfill all your expectations." That would be inappropriate and grounds for someone to fire you. Most people would agree that this sounds kind of crazy, however people behave this way all time time. Consider many of the people I coach. They willingly come into the coaching relationship. If they are in my life coaching group they sign a contract before we start. If they are someone I career coach through my job they sign what's called an engagement agreement with the company. Then when I start with them, in our first session we develop a set of expectations based upon what the client is interested in accomplishing. All of this is an agreement on their part to participate. Many times they slack off to varying degrees. Some don't show up for their session. Some drop out altogether, others complete only a portion of the work. Some communicate, others say nothing at all. Many times they just blithely say they are sorry they couldn't meet expectations. I will never cease to be puzzled. When others place expectations on us that we never invited nor agreed to, it is unwelcome and inappropriate. When we initiate expectations and readily agree to them and then don't fulfill what we agreed to, it's not a case of personal boundary setting/ keeping nor using wisdom, it's a lack of integrity. As far as Christians go, it gets old hearing people labeling a lack of integrity as "being led of the Lord in what to accomplish." Once you've agreed to something it's no longer a matter of being spirit led. That might sound good and grant you time for some extra naps. But it's just spiritual gobbledygook. At the point of your agreement to do something the issue of expectations transcends to a place that simply reveals whether you're either a person of your word or you're not. Character is very much a part of this issue although people would like to think it's just about hearing from God or boundaries. Or, as I heard growing up and have told my children: "All you have is who you are. Your reputation is more important than ANYTHING else!" We (Christians) should let our "Yes" be "Yes!" :) Sometimes, I say yes to too many things....I bite the bullet and get it done....there is no other choice! Terri, I hear you! I too have said yes to too many things and then bite the bullet to do "whatever it takes" to get it done, believing that my integrity means there is no other choice. You are so right but what I don't understand is how so many Christians think there IS another choice, and that it is a perfectly fine choice. When it's an unbeliever I understand it. But how can Christians justify that? Great word Deanna; I often think of integrity when people sign the commitment form for church membership. What promises are made there to be a part of the body of Christ. Integrity is a great problem even in our churches where making an oath before God should stand for something. I think of that too, Kathy. I agree with you. Most people do not fulfill the responsibilities of membership but they sure do want the privileges. 22-25Servants, do what you're told by your earthly masters. And don't just do the minimum that will get you by. Do your best. Work from the heart for your real Master, for God, confident that you'll get paid in full when you come into your inheritance. Keep in mind always that the ultimate Master you're serving is Christ. The sullen servant who does shoddy work will be held responsible. Being a follower of Jesus doesn't cover up bad work.